The Woowh, Woowh, Woowh of our first child’s heartbeat was by far one of the most glorious sounds to ever reach my ears. Only moments before the tech found my sons’ heart, my wife and I had been sitting nervously in the Doctor’s office afraid that we might be on our way to becoming America’s next goofiest couple. After all, who misreads a pregnancy test? But when we saw our son’s little jellybean shape appear on the ultrasound screen accompanied by a strong heart beat our faces burst into uncontrollable smiles. We were having a baby! Just as the recognition of our son’s little heartbeat moved us quickly from insaneville to the corner of happy and reasonable, understanding a child’s spiritual state at conception is foundational to all that follows. Before we can discuss salvation or the beauties of baptism with our grade schoolers, we have to understand what our little wiggle worms need to be saved from. Is a child graced with a morally neutral heart, needing spiritual guidance; or is our little gal given a mostly maladjusted heart that she can overcome with gifted spiritual actions; or did our cute guy inherit a desperately corrupt heart from which he cannot escape apart from the work Christ through the Holy Spirit? According to the Bible, only the last phrase accurately describes the hearts of those who process the glorious social freedom to run about in diapers. “The Bible teaches that children are not good by nature; they are not a ‘blank slate’…they are genetically predisposed to be bad because every child is born with original sin and a rebellious nature” (Fitzpatrick, Newheiser, & Hendrickson, p. 29). Let’s see how this plays out in Romans 5. According to Romans 5:12, every human being enters the world infected by sin. Way back in Genesis 2, Adam was chosen by God to represent humanity. He was blessed with the ability to have a perfect relationship with God. But enticed by the snake, Adam irrationally chose to depart from God’s love. And the moment the fruit hit his lips, Adam radically altered the nature of humanity. He now had a selfishness, prideful, and generally sinful nature. Consequently, all of Adam’s descendants including the sweet baby cooing on her mommy’s quilt have the vile stain of sin on their hearts (Ps. 58:3). As Wayne Grudem notes, “Even before birth children have a guilty standing before God (p. 499)”. We know that this weighty statement is true because all people suffer from sin’s greatest side effect, death. As Paul writes in the next chapter, “The wages of sin is death” (Rom. 6:23a). Sinners die. Now some object to the above statements. They question how babies and infants can be charged with sin if they did not willfully commit an act or recognize what they were doing when they did. For example, the miscarried child never cheated on its spouse or even stole a cookie. And the infant blessed with a short life span never realized that that slapping mommy at bath time violated the fifth commandment. Consequently, some Christians claim that babies are naturally innocent and become sinners with age and action. These proponents are correct to a degree. The Bible teaches that babies and fully grown adults are only held responsible for their actions. But these arguments do not overcome the harsh, practical reality of original sin. Babies die. My son’s heart stopped beating at 2:49 pm on July 16, 2013 only seventeen weeks after our initial visit. The Bible clearly states that my son did not die for my sins or for the sins of my wife (Ez. 18:19-20). He died nestled softly in my arms because he was born with corrupt nature. The apostle Paul noted in Romans 5 that “death reigned…even over those whose sinning was not like the transgression of Adam.” My son did not willfully sin as Adam did by defying the words of God. But his life was still ruled by sin. The lifeless tombstone that sits above my baby’s body is proof positive that his nature was corrupt and in need of a redeemer. Just as his father Adam, my precious son died. Yet, I have hope. Even though my son was born a sinner like his dad (Psalm 51), we serve a God who conquered death through the cross! “The free gift of God is eternal life in Christ Jesus our Lord” (Rom. 6:23b). “Look at yourself in Adam; though you had done nothing you were declared a sinner. Look at yourself in Christ; and see that you have done nothing, you are declared righteous” (Stott, p. 157). This is the gracious hope of every believer: Jesus freely saves! And, our heavenly father greatly delights in bestowing the gift of salvation upon little boys who only grow to be a lovable twelve inches long! All throughout scripture, we find evidence of God saving innocents, those who lack the mental faculties to worship their creator. In Job 3:11-19, we learn that by God’s grace innocents escape the suffering of this world and inherit the glories of heaven. In the New Testament, Jesus reaffirmed the presence of children in heaven, making little ones the centerpiece of several analogies (Mark 9:33-37, Mat. 19:14). As John MacArthur writes, “If children are not readily and fully received into the kingdom of heaven, the analogy to spiritual conversion would be a poor one” (MacArthur, p. 59). And, David famously comforts all parents with jellybean size holes in their hearts proclaiming, “I shall go to him” (2 Sam 12:23). “We cannot say that babies die and go to heaven because they are ‘sinless.’ Rather, babies go to heaven because God is gracious” (p. 72). As the above scripture passages make clear, God saves babies. He has redeemed my son and all innocent children from the curse of Adam by his free gift of salvation. And this same free gift of salvation is available to all who call upon the name of Christ through the power of the Holy Spirit. As Grudem writes, God saves babies and all other people, “entirely on the basis of Christ’s redemptive work and regeneration by the Holy Spirit within them” (Grudem, p. 300). Before we go on, let’s quickly address the age of accountability. I believe the age of accountability to be as elastic as a pair of maternity pants. I’ve known seven-year-olds that legitimately understand salvation and choose to reject or accept it. I’ve seen five-year-olds that don’t. And, I’ve been blessed to minister to forty-year-olds who may never have the mental capacity to repent and accept Jesus as Savior. I think John MacArthur summaries the position well writing, “All children who die before they reach a state of moral awareness and culpability in which they understand their own sin and corruption – so that their sins are deliberate – are graciously saved eternally by God through the work of Jesus Christ” (MacArthur, p. 89). 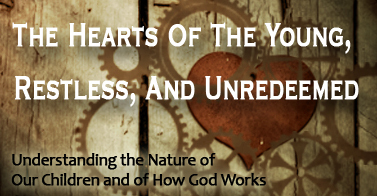 How do we respond to the news that our children enter the world with evil hearts (Gen 8:21)? We respond by calling our children to repent of their sins and to believe in the gospel. We can do so without fearing that we will somehow bump our children off the corner of spiritual neutrality into fire of damnation. As noted earlier, children are born sinners. As J.D. Geear writes, “You didn’t start to sin because you hung around the wrong crowd; you were the wrong crowd” (p.29) They already stand in condemnation and in need of a savior. All of us are ultimately children of Adam. Just ask any parent harboring a member of the terrible two’s gang. They will happily affirm their child’s capacity to sin. Exposing children to truth does not change their initial status before God. Preaching the gospel to our children is a blessing and kindness (Rom. 10:15). All children even the ‘innocents,’ come to salvation through the word of God (I believe babies encounter the risen word of Christ). The best and most loving thing we can do for little sinners is to expose them to the word of God, prayerfully asking the Holy Spirit replace our baby’s heart of stone with a heart of flesh. During the next few weeks, we will look at how God transforms hearts and discuss how parents are supposed to preach the gospel to their children. Geear, J.D. (2013) Stop Asking Jesus Into Your Heart: How to Know For Sure You Are Saved. Nashville: B&H Publishing. Grudem, W. (1994). Systematic Theology . Grand Rapids: Zondervan Publishing House . MacArthur, J. (2003). Safe in The Arms Of God . Nashville: Thomas Nelson. Stott, J. R. (1994). The Message of Romans. Downers Grove: InterVarsity Press.